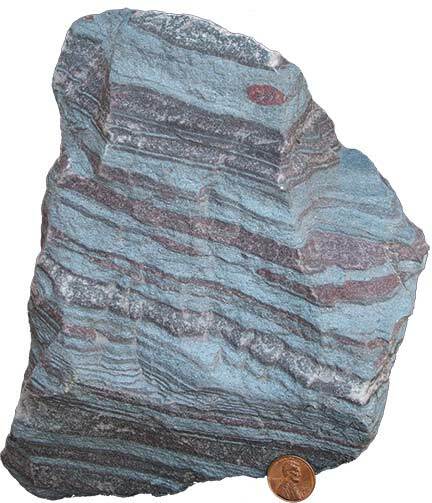 Banded iron formation with alternating layers of silvery gray hematite and reddish fine-grained silica (chert). Iron ore is present in a number of places and geologic settings within Wisconsin. Iron ore can be defined on the basis of its iron content into low-grade ore (taconite), which commonly contains 25 to 35% iron, and high-grade ore, which contains 50 to 70% iron. Iron-bearing ore minerals include oxides, carbonates, silicates, and, in some cases, sulfides. In Wisconsin, the most important iron ore minerals are oxides: magnetite (Fe3O4), hematite (Fe2O3), and goethite/limonite (Fe2O3•H2O). 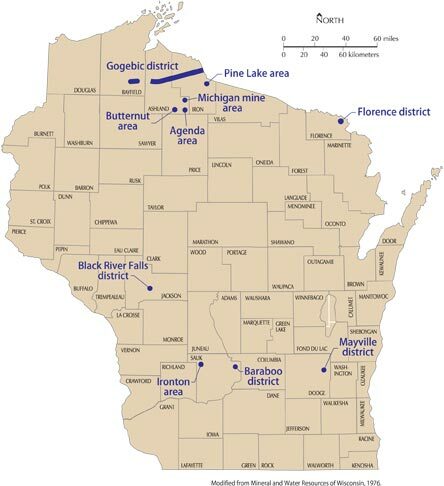 Limited amounts of high-grade iron ore were first mined in Wisconsin in the 1850s in the Black River Falls District of Jackson County and the Ironton area of Sauk County. More substantial iron mining of high-grade ore began in the Gogebic and Florence Districts in the 1880s and continued into the 1960s. Mining in the Baraboo District took place between 1904 and 1925. 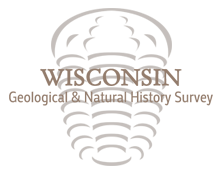 The Jackson County Iron Company re-opened mining in the Black River Falls District in 1969 when they began extracting low-grade taconite ore that was beneficiated (concentrated) and pelletized on site. The mine ceased operations in 1983 and was reclaimed. Significant remaining tonnages of lower grade ore have been identified by magnetic surveys and limited core drilling in several of the aforementioned districts, most notably the Gogebic District in Iron and Ashland Counties. Future development will depend on economic and environmental considerations. 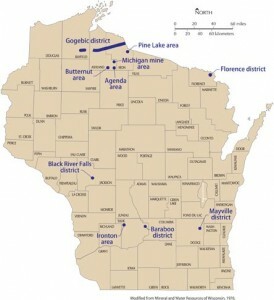 Iron mining in Wisconsin, 2011, Wisconsin Geological and Natural History Survey Factsheet 3. Formatted version of the map and text on this page. Metallic mineral deposits, 2014, Wisconsin Geological and Natural History Survey Factsheet 4. Mining information sheets, prepared by the Wisconsin Department of Natural Resources to explain metallic mining regulations in Wisconsin. Includes information about the permitting process, how the DNR regulates metallic mining, local decisions, and reclamation issues and requirements.